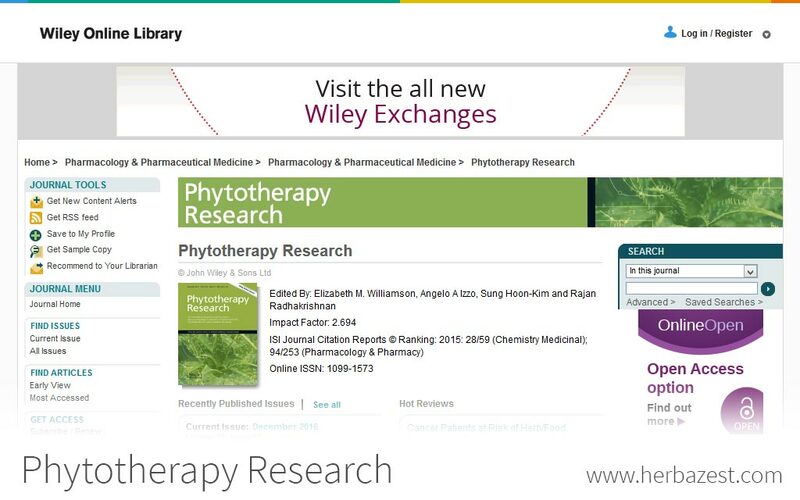 Phytotherapy Research is a peer-reviewed journal that focuses on the toxicological and pharmacological properties of plants. It publishes original research regarding the clinical applications of herbal medicines and food products, with particular attention to their safety levels and interactions with other drugs or ingredients. This monthly periodical was established in 1987 and has a 2013 impact factor of 2.397. Its current editors-in-chief are an international team consisting of Elizabeth M. Williamson, Angelo Izzo, Sung-Hoon Kim, and Rajan Radhakrishnan. What Is Ginseng?, A Comparison of the ancient use of ginseng in traditional Chinese medicine with modern pharmacological experiments and clinical trials, 2008.